A drive through the enchanting countryside of western Hungary will take you to Budapest, a city rich in traditions, situated on the banks of the Danube. 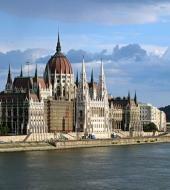 We will enjoy a delicious lunch by the shores of the famous Danube River. In the afternoon during an extensive city tour through the districts of Buda and Pest, you will be able to appreciate the historical and cultural importance of this city, along with seeing the famous Hungarian Parliament. At 05:00 p.m. we will start the return journey to Vienna. Bus trip through district of "Pest"
Guided walk through the historic centre of "Buda"